Time Savors has some rebus scripture stories that you can use in addition to my scripture book handouts below. Show your class the pictures inside your scriptures and briefly explain each one. 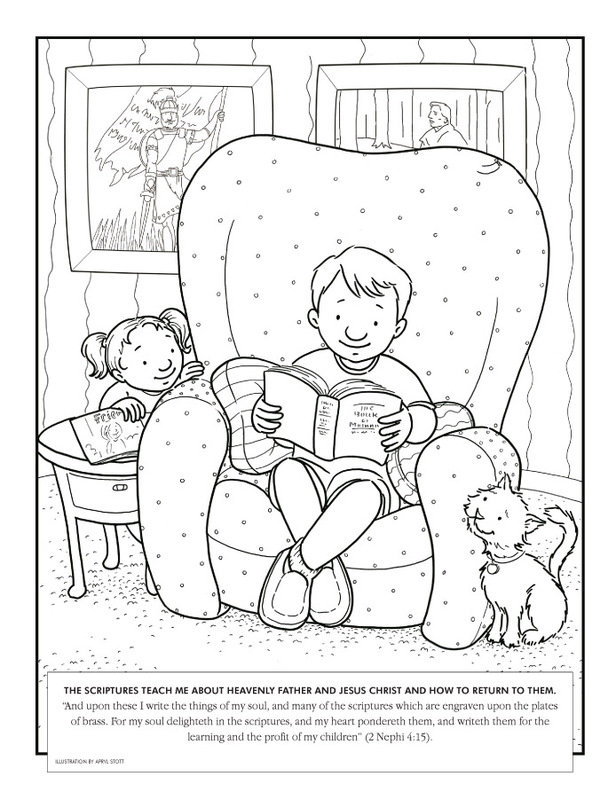 Scripture Stories- You could play some scripture stories for a bit or while they color. I Love the Scriptures booklet- 7 pages total with pictures from LDS.org to show different scripture stories. The Scriptures- Use these flowers and glue pictures of scripture stories to them (or cut out trains, cars, animals, etc). Glue the flowers on paper or attach pipe cleaners and make a bouquet. More ideas below the flowers. Search the Scriptures- A fun find the hidden objects pictures but can use as just a coloring picture. I Can Gain a Testimony by Searching the Scriptures- another coloring page but a girl this time. Search the Scriptures- Color and make the bookmark- its something different anyway...you can tell them to use it when they read scriptures as a family. The Words of Christ- Do activity as is or use the scripture cut outs to make a fun necklace or bracelet- punch holes, string on yarn, even use fruit loops or straws for in between. Comfort and Courage from the Scriptures- A David and Goliath Dot-to-dot but could just color and more activity ideas below. I Feel Reverent when I Read the Scriptures- Use as coloring page or make a mini booklet with other pictures mentioned here or draw your own. Bring stickers for them to decorate the blank pages if you want. The Power I Get Each Time I Read- I put this one in because I love the song, Scripture Power, but the bookmark can be fun then you can give them stickers to put over the boxes for fun. The Scriptures Show the Way- Make scripture puppets! Tell the scripture story using the puppets (glue on a stick or straw) then let the kids take one home or make a few for all. Search the Scriptures- Use as a coloring page for for FHE as a reading chart. Read the Scriptures Daily- Scripture Reading chart but you could just color it.